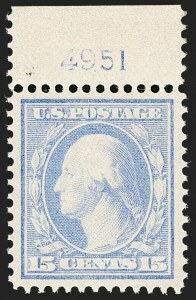 EXTREMELY FINE GEM EXAMPLE OF SCOTT 335, GRADED SUPERB 98 BY P.S.E. -- THIS IS THE HIGHEST GRADE AWARDED. With 1987 P.F. and 2006 P.S.E. certificates (Superb 98; SMQ $3,000.00). This is the highest grade awarded and it is shared by only four others. 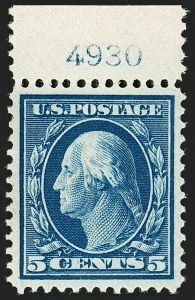 EXTREMELY FINE GEM EXAMPLE OF SCOTT 339, GRADED SUPERB 98 BY P.S.E. -- THIS IS THE HIGHEST GRADE AWARDED. EXTREMELY FINE GEM. 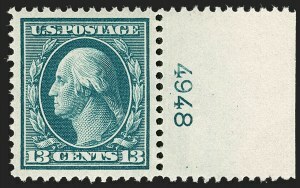 THIS STUNNING ORIGINAL-GUM EXAMPLE OF THE 4-CENT HORIZONTAL COIL, SCOTT 350, IS GRADED GEM 100 BY P.S.E. -- THIS IS THE ONLY EXAMPLE TO ACHIEVE THIS HIGH GRADE IN ANY CATEGORY. According to Johl (Vol. 1, page 153), this coil was issued approximately eighteen months after the horizontal coil Scott 354 and was only in use for a short period of time. With 2009 P.S.E. 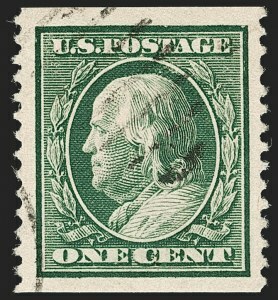 certificate (OGph, Gem 100; SMQ $8,750.00). This is the highest grade awarded in any category (single, pair, guide line pair, used or unused) and it is the only example to achieve this grade. EXTREMELY FINE GEM. THIS STUNNING MINT NEVER-HINGED GUIDE LINE PAIR OF SCOTT 351 IS GRADED SUPERB 98 BY P.S.E. -- THIS IS THE HIGHEST GRADE AWARDED AND IT IS THE ONLY EXAMPLE TO ACHIEVE THIS GRADE. 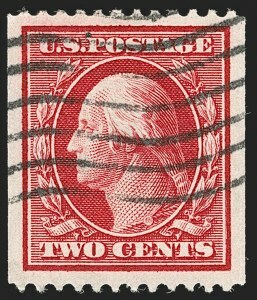 Interestingly, this is the only 5c Washington-Franklin perforated vertical coil stamp ever produced. Demand proved to be so low that no others were made. With 2009 P.S.E. certificate (Superb 98; SMQ $13,500.00). This is the highest grade awarded and it is the only example to achieve this grade.